Are Otters No More Endangered Species? A wild otter sneaked into a garage of a confenience story in the center of Busan, the second largest city in South Korea on Nov. 8, 2017. The highly endangered species in the nation belong to the Eurasian otter (lutra lutra) among scores of different types. 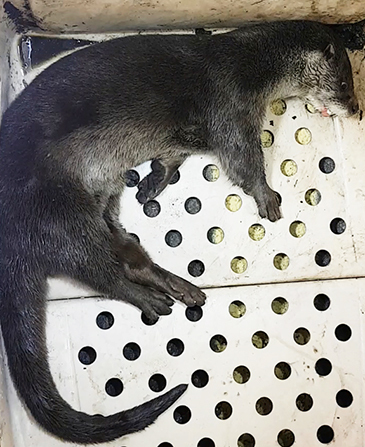 The adult otter was soon caught by officials of nation's fire agency and sent to the nearby animal shelter for release later into the nature. Experts said that the otter was believed to move all the way to the convenience store as it moved along the stream searching for food. Unlike Japan where the wild otters deemed to extinct, otters in the nation were found frequently particularly in the rivers and streams. A couple weeks ago, another otter was found in a stream in Gapyeonggun Country in Gyeonggi Province north of Seoul. The otter was photographed by a resident. The otter was playing in the middle of the stream, catching and eating a fish. Some months earlier a motorist caught a sight of an otter in Geumgang High Rest Area on Seoul-Busan Expressway in the morning. The motorist said that he saw an adult otter in the back of the rest area which leads to the Geumgang River below. Early in 2017, otters, a family of several otters, were spotted by people in the upper part of Han River. According to the Han River Basin Environmental Office, revealed that unmanned cameras captured footage of a mother otter and three cubs, releasing the footage to the public. Others also said that they caught a sight of the highly endangered animals at the Han Rive embankments particularly Paldang Dam areas in the upper part of Han River. The otters disappeared completely for some 40 years in the past. Experts say that the number of wild otters is on the rise although there is no particular statistics. Others disagree. The reason of frequent sightings of otters is because otter move long distance for activities. They argue that otters can move more than 10 kilo meters at one time for food, saying the same otter spotted in one place can be seen at other place far away. Officials of the nation's environmental department say that the appearance of otters in the urban areas mean that their natural habitat was destroyed. The main habitats of otters in South Korea are rivers and streams including island areas including Jeju Island. The western and southern coastal areas also are popular habitats for otters in South Korea, according to the experts. Experts day that otters are highly intelligent animals, fit for pet animal for the family. However, otters cannot be raised as a pet, because they were designated by the government as the highly endangered species in 1982.